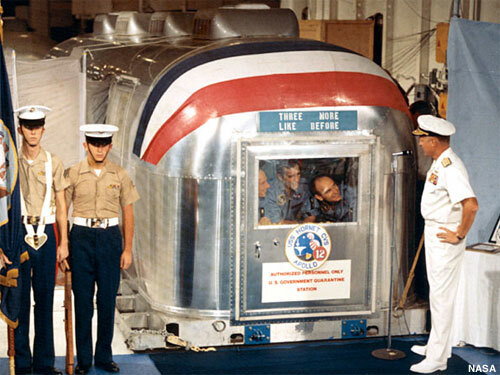 The Huntsville Times reports that the Apollo 12 mobile quarantine facility has resurfaced at a fish farm. The U.S. Space & Rocket Center has landed a prize catch at a west Alabama fish farm. Above: Rear Admiral Donald C. David, Commander, Manned Spacecraft Recovery Force, Pacific, welcomes the crew of the Apollo 12 lunar landing mission aboard the U.S.S. Hornet, prime recovery vessel for the mission. Museum officials found a long-lost Airstream trailer that was used to quarantine Apollo 12 astronauts returning from the moon in November 1969. The trailer has logged a circuitous route since being sold by NASA as surplus and has spent the last two decades at an aquatic research farm in Marion in Perry County. "What kind of find is it? It's like finding a Rembrandt in a yard sale. There aren't going to be any more of these," said Al Whitaker, Space Center spokesman. Officials plan to retrieve the artifact and display it in the new Saturn V building. "...like finding a gold nugget." The Mobile Quarantine Facility (MQF) once used to house the Apollo 12 astronauts upon their return from the moon has been found, rescued and is now in Huntsville where it will eventually become a permanent display in the Davidson Center for Space Exploration at the U.S. Space & Rocket Center. It's a remarkable story that would have had a very different ending had it not been for one man who recognized the artifact and took steps to make certain the MQF would find a new home where it would be restored and properly displayed. Dr. Paul Johnson, the newly appointed Director of the Alabama Department of Conservation's Aquatic Biodiversity Center at Marion, says he knew at first glance there was more to the trailer than officials realized. A space enthusiast, Dr. Johnson had seen the Apollo 11 MQF while it was on display at the U.S. Space & Rocket Center and quickly realized the trailer in Marion appeared identical. Four MQF trailers were produced and delivered to NASA in early 1969. They would be used to quarantine astronauts returning from the moon while scientists ensured the crews had not brought dangerous microbes back to Earth. Three of the MQF's were used to house the crews of the first three lunar missions. The fourth MQF was never used. The MQF that housed Apollo 11 astronauts Neal Armstrong, Buzz Aldrin and Michael Collins was put on public display at the U.S. Space & Rocket Center, where it stayed for approximately 30 years before being "called home" by the Smithsonian. It is now on display at The Steven F. Udvar-Hazy Center near Washington Dulles International Airport. The other three were declared surplus and were transferred to other agencies. Up until March of this year the location of the Apollo 12 MQF had been a mystery. Records indicated in the mid-1970's NASA had turned it over to the Center for Disease Control (CDC), who used it to transport scientists back to the U.S. after they had been exposed to a dangerous virus in Sierra Leone. After several years in storage, the CDC reportedly handed the MQF over to the Georgia Department of Forestry for use as a mobile command center, where it was reportedly destroyed in a fire. For years, no one could dispute the report and it was assumed the Apollo 12 MQF was forever lost. That is, until March when Dr. Johnson's email arrived at the USSRC. Within days, USSRC staff members were on their way to Marion to see for themselves and were amazed to confirm the MQF, serial number 2, had in fact been found. What's more, it was in remarkably good condition and was in a position for ownership to be permanently transferred to the U.S. Space & Rocket Center! "Thinking back, I would have liked to have seen the expressions on our faces as we came up on it," said Mike Kelly, the USSRC's Vice President of Domestic and International Licensing and one of the staff members who traveled to Marion to see the MQF. He adds, "It was like finding a gold nugget." In the days that followed, the paperwork trail for the unit surfaced and it was discovered the CDC had actually transferred the unit to the U.S. Geological Survey's Biological Resources Division in the early 1990's. That's how it got to Perry County and to the fish hatchery the USGS operated near Marion until closing the facility in 1995. In January, 1998, the U.S. Government conveyed ownership of the old hatchery, including the property, buildings and associated equipment, to the Alabama Department of Conservation, and just last year the State of Alabama initiated efforts to convert the site into a research facility to study endangered aquatic species. Dr. Johnson took over earlier this year. Ownership of the MQF has now officially been transferred to the U.S. Space & Rocket Center and the unit was carefully moved to Huntsville earlier this week. For now, it's being stored in a warehouse at the USSRC until arrangements can be made for its restoration. While the exterior is in very good condition, the interior was drastically altered to accommodate graduate students who temporarily lived in the MQF while conducting research at the former USGS hatchery. Progress is already being made in locating original construction records, including schematic diagrams and photos, and the USSRC is confident the entire unit can be restored to its original appearance. "The historical significance of the MQF cannot be overstated," says the USSRC's CEO, Larry Capps. "You don't stumble across something like this very often and we were lucky to get it. To say it's exciting doesn't come close," he adds. Capps adds that every effort will be made to have the MQF restored and on display when the new Davidson Center for Space Exploration opens January 31, 2008, but he quickly admits it's an ambitious schedule. "Our first priority is and continues to be the completion and opening of the new Davidson Center. As for the MQF, it depends on how much of the actual work we have to do ourselves." He added that if it's not on display when the new building opens, the MQF will be revealed at the earliest possible opportunity. As for Dr. Johnson, Mr. Capps said, "We owe this man, and for that matter the Alabama Department of Conversation, a debt of gratitude. As a result of their efforts, many future generations are going to have the chance to see the MQF. We hope to get Dr. Johnson up here soon so that the people of Huntsville can meet him and show their appreciation." The four MQF's were built by MELPAR, Incorporated, of Falls Church, Virginia, a subsidiary, at the time, of the Westinghouse Air Brake Company and the American Standard Company. MELPAR was eventually acquired by E-Systems Inc. and remains in operation today as a subsidiary of the Raytheon Corporation.